The Husky 1/4 inch x 1/4 inch NPT Female Industrial Coupler connects with a 1/4 inch industrial-style plug for quick, easy changes. Compatible with most air hose and piping fittings, the couple has heat-treated lock balls and a brass construction for long tool life. Tubular valve design body permits high flow rates for better tool performance. Sleeve guard prevents accidental disconnects and protects the coupler sleeve. The Husky 1/4 inch Air Compressor Filter is designed to remove unwanted dirt larger than 5 microns and condensed water from air compressor hoses. This may include dust, dirt, pipe scale, rust, liquid water, and oil. The filter has a 1/4 inch female NPT port and has a flow capacity of 21 SCFM at 90 psi. The bowl screws on top of the clear filter and drains manually. This Husky 1/4 in. Feale Safety Coupler is built to industrial standards for professional use and is available exclusively at The Home Depot. The design is ideal for the contractor or professional users. It's unique push button design allows for fast and easy connection and disconnection of tools while eliminating air pressure and air blow back. 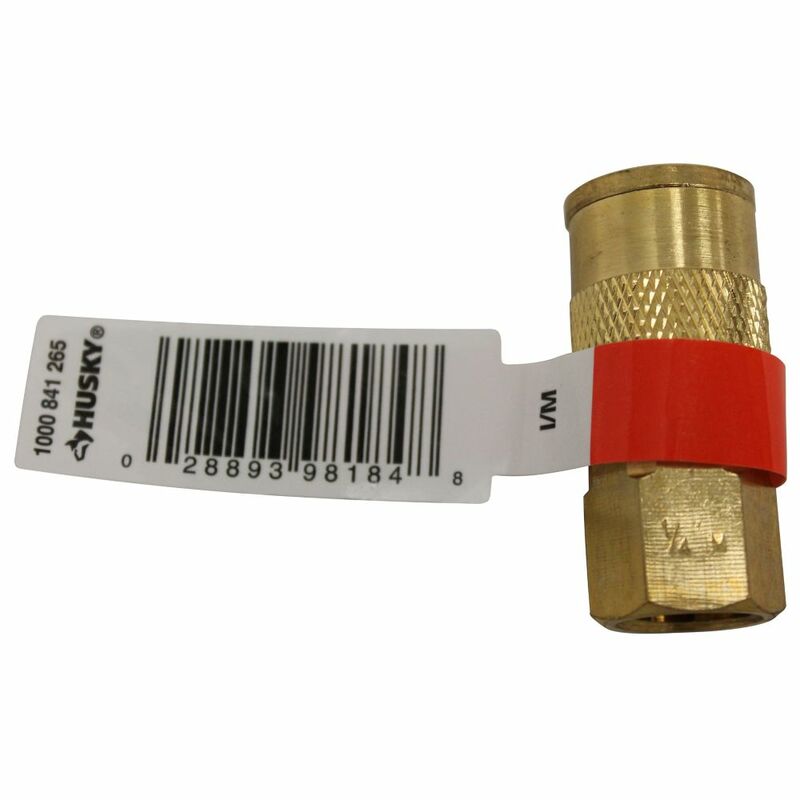 The Husky 1/4 inch x 1/4 inch NPT Male Automotive-Style Steel Plug quickly and easily joins pneumatic and fluid transfer lines. The automotive design fits popular styles. A must have to get the job done quickly. Requires a coupler with an identical body size for interchanging. 1/4 Inch Female Brass Coupler The Husky 1/4 inch x 1/4 inch NPT Female Industrial Coupler connects with a 1/4 inch industrial-style plug for quick, easy changes. Compatible with most air hose and piping fittings, the couple has heat-treated lock balls and a brass construction for long tool life. Tubular valve design body permits high flow rates for better tool performance. Sleeve guard prevents accidental disconnects and protects the coupler sleeve.